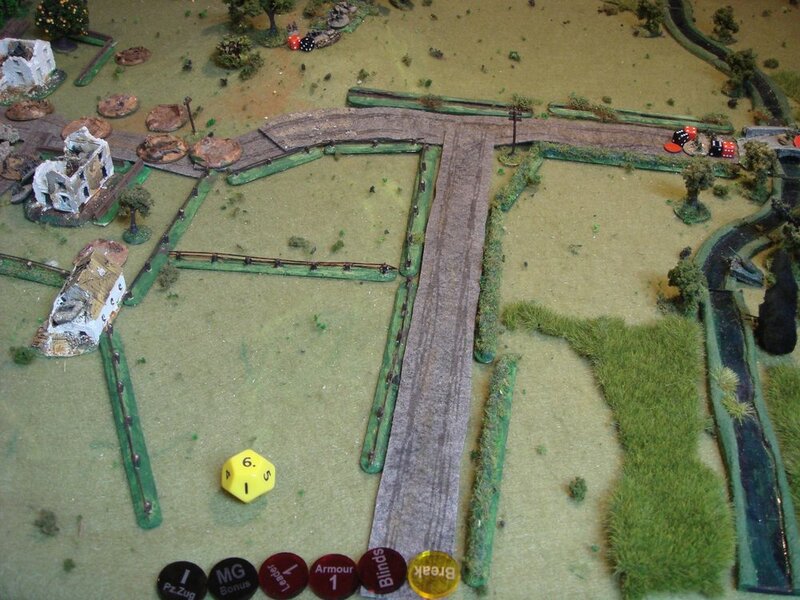 A recent quick solo game: a Soviet assault on a German defended village. 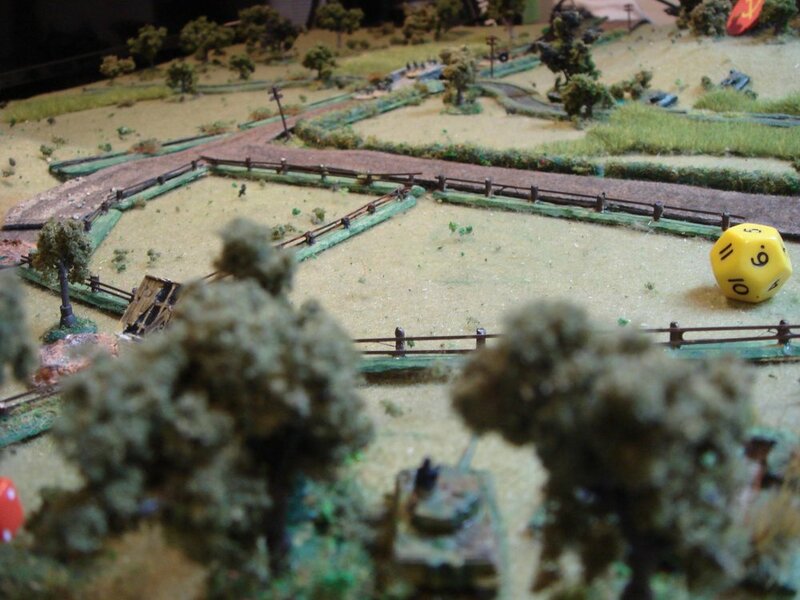 Two platoons of German regulars (plus two MMGs) in the village and low hills either side, backed up by a lone Tiger I. The Soviets: three infantry platoons plus a depleted mixed T-34/76 & /85 tank company. The Soviets also get a couple of pre-game stonks. Soviets enter under Blinds from the right. The stream is fordable and the darker green areas are marsh. Some low tree covered hills, bottom left and right and top right. 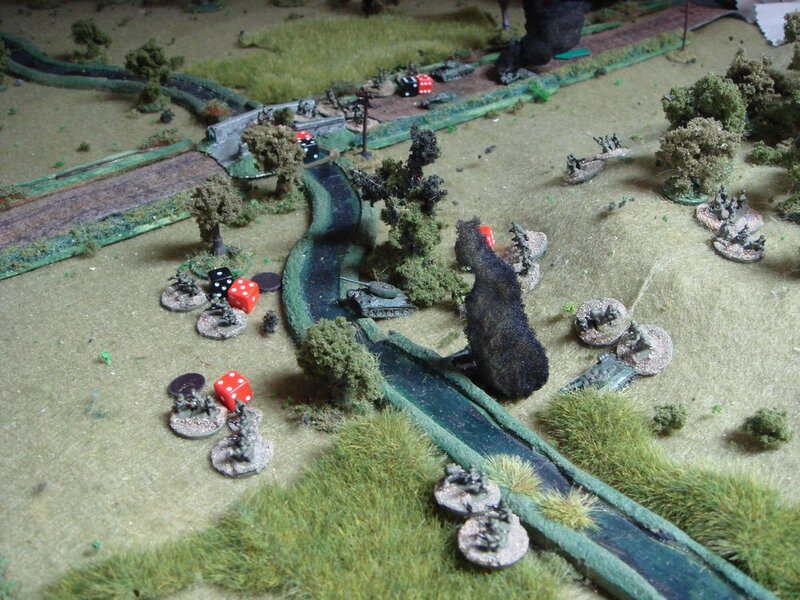 The Soviet stonks cause some kills on the MMG teams located top and bottom hills plus a fair amount of Shock. However, this will not effect the firepower of the MMGs. 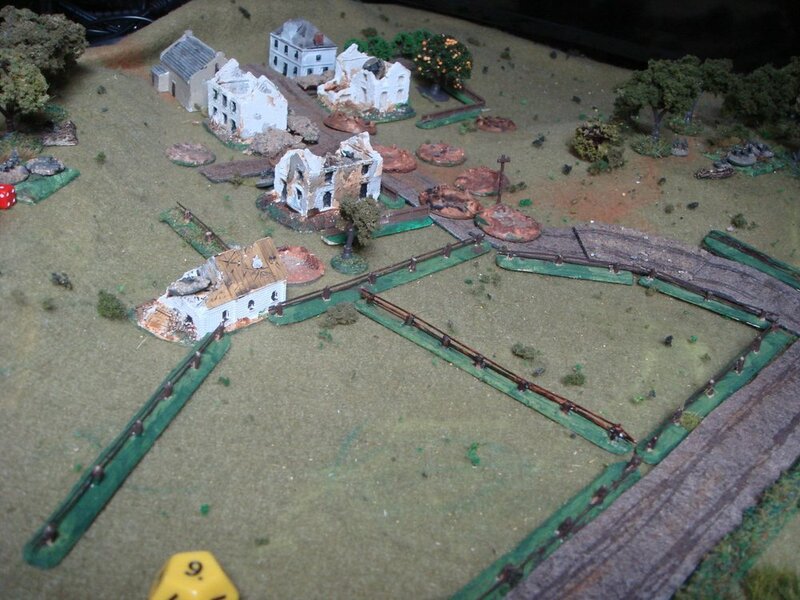 The is the view of the German held village with hills either side: a couple of squads each in left/middle/right. View from the South Western hill, with the Tiger and MMGs covering from the hills. The Soviet lead platoon advances down the road with tank support under Blinds. Another view from the hill. Just visible are the Soviet infantry crossing the bridge and another Blind appearing on the hill opposite. The Germans hold their fire. 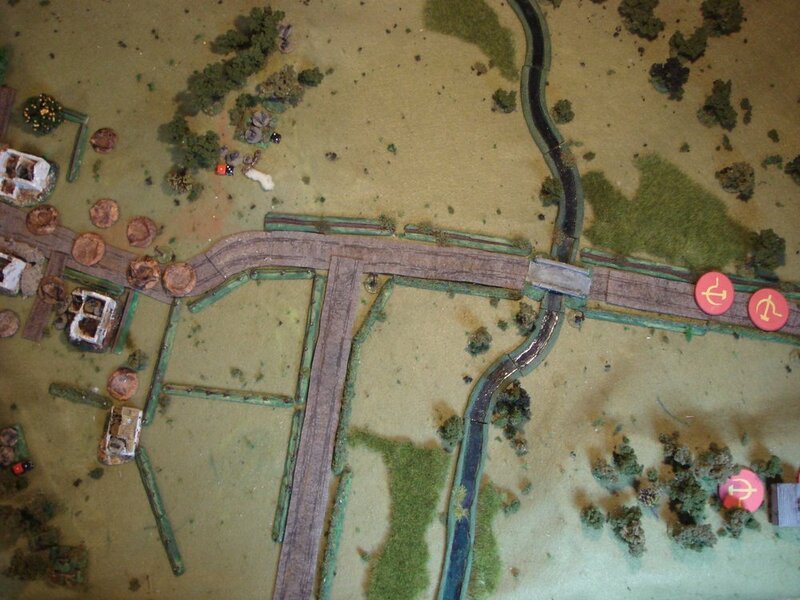 The MMG at the top opens fire on the Soviet platoon crossing the bridge. 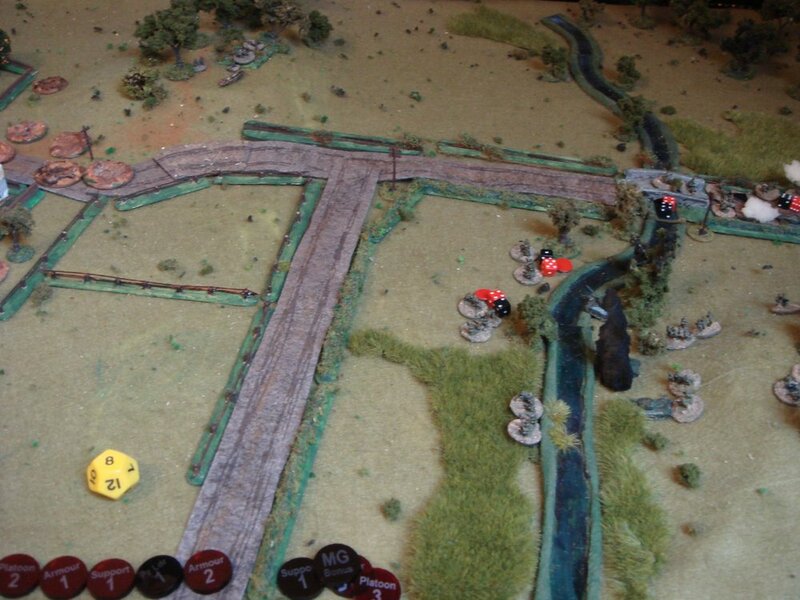 At Close Range it is murder and the lead squads on the bridge are decimated! The Tiger has started to pick off the T-34s as they appear. Despite taking a few hits, its armour is too much for the /76s and /85s. Seeing the platoon shot to bits on the bridge, the Soviet leader orders the remaining two platoons to charge down the hill and cross the stream...a classic human wave supported by the remaining T-34s, one of which is knocked out by the Tiger I. The supporting T-34s have silenced the MMG on the hill at the top, but...too late! The squads have routed back across the bridge. Another MMG just out of shot to the left, again on a hill, now opens fire on the troops crossing the stream, and again the results are bloody! The red markers show suppressed troops. A close-up of the slaughter by the stream. With half the Soviet force having taken heavy losses from the two MMGs, the Soviet company commander decides to call it a day. I'm sure the commissar will understand! The attackers were desperately in need of more support, either a couple of SU-85/100s to take on the Tiger, freeing up the T-34s to support the infantry or some mortars to suppress the MMGs. Smoke! Oh, for a 2" mortar! Infantry fire with a height advantage gets an extra dice - maybe causing the MMGs to be too powerful. Vehicles are either moving or stationary, with one Action to stop. Firing at a moving vehicle or more difficult and fire from a moving vehicle gets a -4 on the Direct Fire table. Changed the direct fire HE rules to something that was suggested on the forum as the originals seem odd. Changed the ground scale to 10m = 20mm because of the small playing area. IABSM is great for a solo game as using 'cards' for to generate the turn sequence is easy to follow! Perhaps next time add a couple of SU-100s or use a Stug rather than the Tiger I which seriously over-matched the T-34s.